Karamel Krunch Handmade Halloween Candy for sale. Buy online at Zingerman's Mail Order. Gourmet Gifts. Food Gifts. Make Halloween extra special (and tasty)! 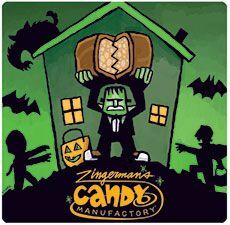 For a very limited time, the oompa loompas at Zingerman's Candy Company have created a bite size treat that has us all wishing we could go trick-or-treating again. As a matter of fact, if word gets out in the neighborhood that you've got Karamel Krunch in your candy bowl, you'll have more adults ringing your doorbell than kids this Halloween! They start with muscovado brown sugar caramel that they mix with crisped rice, then they enrobe it all in milk chocolate, cut them into bite size pieces and seal them in shiny silver foil wrappers. Each bag contains thirty-six individually wrapped pieces that you can dole out on Halloween or keep for yourself or a more adult Halloween party. Supplies are very limited and they won't be making any more so grab a bag (or two) today and make this Halloween one to remember. "This chocolate bar... reminds me of being a kid. The caramel adds a nice chewiness to the crispy puffed rice, all covered in creamy milk chocolate."